"Farm to table" was Jesse Cool's mantra long before it became a cliche in the food industry. Owner of Flea Street Cafe, which won awards in two categories, Ms. Cool has been a leader in the sustainable food movement, serving only fresh, in-season, organic and local ingredients since her Menlo Park restaurant opened more than 35 years ago. Chef/owner Carlos Canada works with Ms. Cool to present a menu of "old-fashioned recipes with a modern twist." Recent offerings included grilled yellow peach and burrata salad, a summer vegetable tasting, pasture-raised chicken, Webb Ranch berry tart and strawberry shortcake. What could be more American? The soft lighting, series of nested rooms, and background of cool jazz make Flea Street Cafe our readers' ideal choice for a cozy dinner for two. Cafe Borrone continues to be one of the most popular gathering spots in Menlo Park — as any visitor to the plaza in front of the cafe and neighboring Kepler's bookstore can see. Enjoying breakfast, lunch or dinner outside or indoors has been a favorite pastime of area residents for more than 25 years. 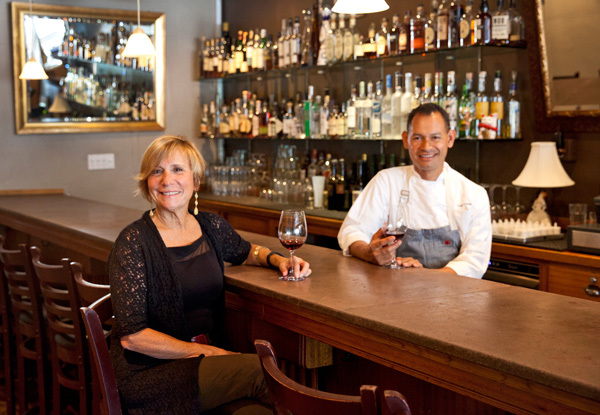 The restaurant was opened by Roy and Rose Borrone, and is now operated by daughter Marina Borrone and her husband, chef Josh Pebbles. In crafting the menu, Josh and Marina focus on choosing sustainable fish and organic meats, and supporting local farms. Friday night diners are often treated to the sounds of Clint Baker's Borrone All Stars jazz band. "We absolutely love sharing life with the community," Marina says. "It's family with extended family." P.F. Chang's at Stanford Shopping Center has won the Readers' Choice award for favorite Chinese restaurant. Manager Danielle Eastman attributes its popularity to the friendly staff and, of course, the food. The old classics are still there but new choices, such as the Dynamite Scallop Roll and the Lobster Avocado Roll, keeps diners coming back, she says. In addition to the variety of meat, chicken, seafood and vegetarian options, customers like the restaurant's cability to handle large parties. Jeffrey's Hamburgers, winner of the Readers' Choice award in the Dine with Kids category, offers menu choices that will satisfy adults as well as children, says Serge Karanov, owner of the Menlo Park restaurant that appeals to families. In addition to burgers, hot dogs and milkshakes, there are a variety of other sandwiches, plus burger bowls, salads and seafood. Customers give the restaurant high marks for cleanliness and creating a family-friendly atmosphere. The fresh ground beef, of course, is a big draw. Left Bank French brasserie, in downtown Menlo Park, is even more popular with local diners since it expanded its outdoor sidewalk seating. Opened in 1998, the restaurant was completely remodeled in 2008. Classic brasserie items, such as steak frites, onion soup, cassoulet, and escargot, are available, however, since July 1 there is a renewed emphasis on farm-to-table and organic products at all five left Bank restaurants, says general manager Edmond Zencirci. Late summer specialties include heirloom tomato salad, and a salad of locally raised spinach, Frog Hollow Farm apricots and pecans. For a sweet finale, try the profiteroles with chocolate sauce. "It's very heartening that people are so loyal. We're lucky to have so many friends, They're like family to us," says managing partner Ciya Martorana upon hearing that once again Almanac readers have declared Carpaccio their No. 1 choice for gracious dining in a Tuscan atmosphere. You' ll find all the Italian classics, such as lasagne, cannelloni, eggplant Parmesan and tiramisu at Carpaccio, but chef Chay Mendez keeps things lively with his weekly specials. Recent specials have included bruschetta with cherry tomatoes, arugula and burrata cheese with prosciutto, and risotto with spring vegetables. Another new addition, banana cream pie, is proving to be a big hit with diners, says Ciya, whose business partners are Bob Columbo and Aaron Ferer. 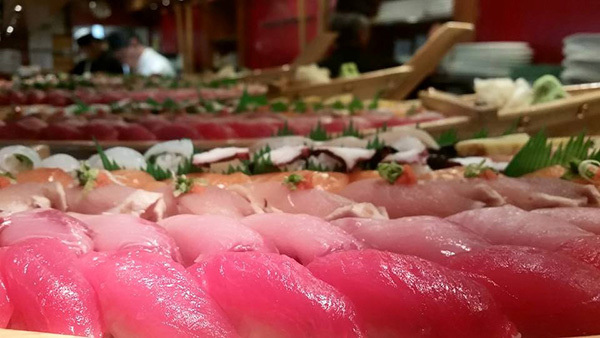 According to General Manager Lumi Gardner, a factor that makes Fuki Sushi stand out is its diverse menu. "Our amazing chefs from Japan in team with our serve staff and management is how we can execute this menu," she said. In addition to the delicately crafted sushi rolls with well-cooked rice and fresh seafood, some of the most popular items on the menu include the warm and light Miso Soup and the tasty Udon noodles. The dine-in restaurant has varying atmospheres, from a lively sushi bar to casual tables and the private tatami rooms in the back. Cafe Del Sol won Readers' Choice laurels again in the Mexican restaurant category. It's a popular dining spot for locals seeking modern Mexican cuisine. They say they like the variety of its fresh and tasty choices. In addition to classic ceviche, the restaurant recently added to its menu La Jolla ceviche, as well as ribs with three different kinds of sauces, and a special side of orange rice. Owner Lionel Diaz says the kitchen pays close attention to preparation of meat and chicken, and samples the food every day to make sure the taste is just right. 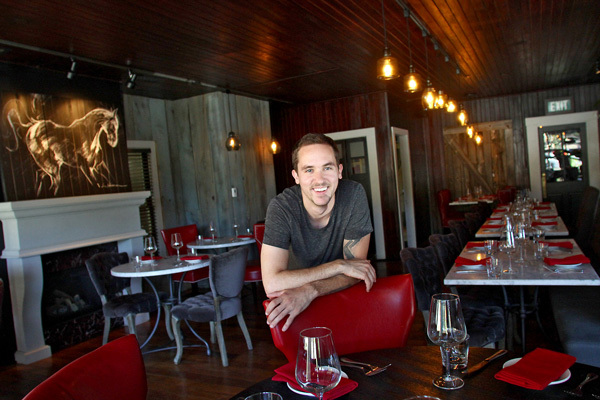 The award for favorite new restaurant goes to the Firehouse Bistro in Woodside. Owners LeeAnn and Bill Gilbert have owned the building for many years, and when it became vacant recently, decided to open their own restaurant. The two aren't novices. They have had a Lake County restaurant for 12 years and ran a hotel for 20 years. LeeAnn Gilbert says she thinks customers "are happy that we have high quality food at reasonable rates," and also appreciate the restaurant's elegant, yet rustic decor with a touch of whimsy. Chef Nate Tauer, who previously worked at Bouchon, is "a fanatic" about only using the best ingredients and sources, Ms. Gilbert says. Many of the fresh vegetables and some of the wine come from the Gilberts' Lake County ranch. "We don't have anything in the freezer except our ice cream," Ms. Gilbert said. They have been serving dinner only on Tuesdays to Sundays, from 5 to 10 p.m., as well as private parties, but hope to soon start serving Sunday brunch. Deep burgundy walls, white linen covered tables glowing with candlelight and set far enough apart for intimate conversation, The Village Pub is the perfect place for a romantic evening, be it "getting to know you" or an anniversary celebration. Handsome decor is only a small part of the Pub's success. The impeccable food and professional service make this one of the Bay Area's highest rated restaurants. Fresh produce from the restaurant's 17-acre SMIP Ranch in Woodside, as well as high quality meat, fish and ingredients, is prepared by executive chef Dmitry Elperin. A recent menu offered such entrees as sesame crusted squab with seared fois gras and sauteed ramps and grilled rack of pork with peach mostarda and crispy squash blossoms.